“There’s not a single person here in favor [of the helipad construction].” Takae resident Naohide Urasaki, 68, speaks in an emphatic tone in response to such criticism. 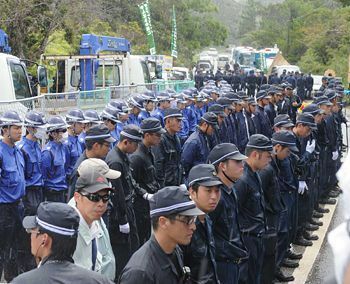 Takae residents released resolutions opposing the helipad relocation at assembly meetings in 1999 and 2006. Nevertheless, Higashi Village Mayor Seikyu Iju accepted the relocation, and two of the six planned helipads have already been built. Urasaki himself almost never participates in the sit-ins protests. “I want to join the movement, but with my fields to tend to, I can’t spend the whole day there,” he explains. The ward of Takae has only 140 residents, most of whom make a living as farmers. If a farmer neglects his fields for even a day, it will negatively affect his crops. Many people are opposed to the helipad construction but are unable to protest actively because their livelihoods are at stake. Ward chief Kumiko Nakamine, 66, says that she thinks of the residents of her ward as family. Her face shows fatigue as a result of endless questions from groups of reporters. “The policing is intense, and traffic has increased. I worry that it will negatively impact the lives of the residents here,” she says, expressing her concern. Okinawa Governor Takeshi Onaga has conveyed to the national government his opposition to the relocation of U.S. Marine Corps Air Station Futenma to Henoko, Nago City. The construction at Henoko is currently stopped. In the small ward of Takae, people struggle between a sense that even if they raise their voices, nothing will change, and a desire to see the situation change through a spread of awareness nationwide.